Because I give full-throated support to the development, manufacturing and use of vaccines, one might think I was some sort of promoter of the pharmaceutical industry. In fact, I care about vaccines generically, and do not care about the system that gets vaccines into the hand of physicians. Frankly, pharmaceutical companies have the money and means to investigate new vaccines and improve old ones, which means it’s our only choice. Maybe it would be better if the CDC or WHO were responsible for vaccines (and more or less, they are, but not for the manufacturing), but governments come and go, and there would be varying levels of support for the research. I could imagine a time where an antivaccination candidate running for US President would demand the cessation of government support of vaccine research and manufacturing, thus ending supplies of vaccines to US citizens. That would be a horrible scenario. But let’s assume that the 90-95% of Americans who vaccinate won’t vote for someone that delusional. Pharmaceutical companies have done many wonderful things for humanity, and part of the reason we can live longer, while still being productive, is almost exclusively a result of pharmaceutical and medical innovations, especially over the past 20 years. I’m not going to list out every single revolutionary invention out of the pharmaceutical industry, but in the areas of cancer medications, antibiotics, vaccines, cardiovascular and orthopedic devices, and a few other areas, Big Medical (because it’s really more than just pharma) allows you to live longer and better. You might want to convince yourself that eating some odd diet, downing a handful of supplements or smoking weed prevents or cures cancer. But that’s not science based. Science tells us that staying out of the sun, stopping smoking, and or getting the HPV vaccine have a direct and large impact on cancer rates. Taking vitamin C does not. How we cure cancer is early detection with advanced MRI and CT scanners (along with lots of other tools, including education of patients). How we cure cancer is having a huge armamentarium of chemotherapy, radiotherapy, and surgery, all based on real scientific evidence. Evidence-based oncology, in partnership with Big Medical, have numerous successes in the war on cancer. Yes, it’s a cancer by cancer war, but it’s going in the right direction. But every few months a report will be published that makes everyone, including supporters like me, shake their heads and wonder if some drug companies and some executives are so blind, so unethical, that it poisons the well for the whole industry. And that just happened this week with the drug, dabigatran (known as Pradaxa in most countries), an anticoagulant manufactured and sold by the pharmaceutical company, Boerhinger Ingelheim. First a little background. For individuals who have an abnormal heart rhythm called atrial fibrillation, there is a moment when the heart goes in and out of rhythm when there is a potential for a clot to form in the heart. 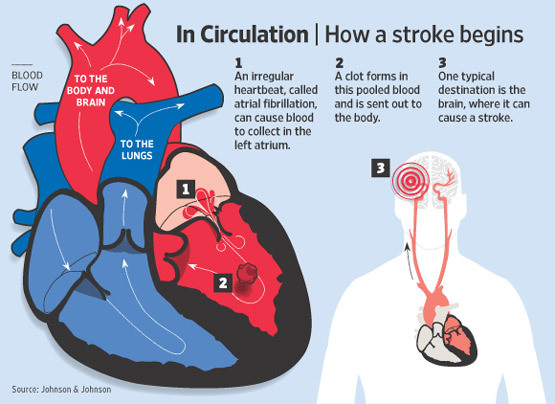 If this happens, and the clot could flow to a cerebral artery, creating a high risk for a stroke, some of which can be very serious. Since there really is no cure for atrial fibrillations (there are some medications that can reduce the frequency, but the clot risk remains; there is an interventional cardiology procedure that may cure the atrial fibrillation, but it is only indicated for those that have a chronic irregularity), and for which there is no known cause, treating physicians must prevent the formation of clots. The best method to reduce the risk of clotting is to utilize anticoagulants. But it’s not that simple, you can’t just prescribe a clot preventing medication, which, in the past, was mainly warfarin (also known as Coumadin). Because physicians wanted to balance the clot prevention against excessive bleeding, a standard clotting time test was developed, which then allowed the physician to establish the right warfarin dose (while also regulating the diet to reduce the amount of vitamin K rich foods which actually counteracts the effects of the anticoagulants). To do this, “Coumadin Clinics” were established, where patients got their clotting times tested weekly or monthly, and doses were adjusted to hit the sweet spot between blocking clot formation but not increasing bleeds. For many people, this regular and frequent blood testing is a major inconvenience, which reduced compliance to warfarin therapy, which also increased risks of bleeding. Dabigatran (and two other medications that aren’t a part of this discussion) was supposed to fix all of this. It was approved by the FDA in 2010 for the prevention of stroke and blood clots in patients with abnormal heart rhythm (atrial fibrillation). It’s one advantage, making it superior to warfarin (which is generic and cheap), was that frequent and regular testing of blood clot times was unnecessary. However, the claim that clotting time testing was unnecessary was not universally accepted, and no actual scientific consensus formed. Fast forward to July 2014, and Deborah Cohen, published in the BMJ, wrote that Boehringer Ingelheim (BI) withheld critical data from pharmaceutical regulators regarding the safety of dabigatran while the drug was being reviewed for approval in preventing clots (and strokes) resulting from atrial fibrillation. Ms. Cohen uncovered four documents that provide the basis of a scathing indictment of BI’s activities during the approval process. According to Ms. Cohen’s analysis, BI didn’t share its own analysis with US or European pharmaceutical regulators that suggested that bleeding risk from dabigatran was reduced when dosage was determined by guidance from clotting time monitoring, exactly what is done with older medication, warfarin. 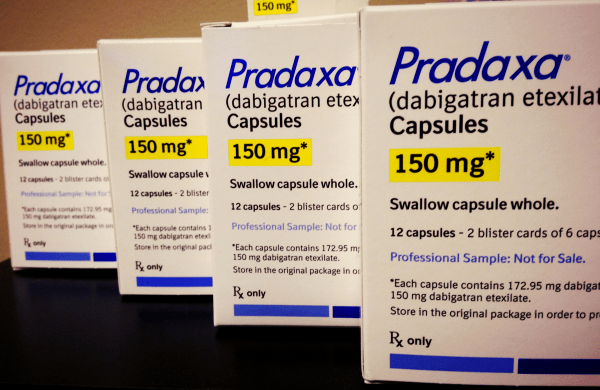 If regulators had known this information, it would have removed a key claim from dabigatran, that it doesn’t require frequent laboratory testing, which would justify a higher price and more prescriptions, a win-win for the pharmaceutical company. But with this data, which seemed to be out in the medical world in 2009, there probably is no reason to switch from the cheaper warfarin (which costs around US$100-200 per year) to the much more expensive dabigatran (around US$3000 per year). In other words, there was a developing body of evidence that Boehringer Ingelheim, to protect the marketability of dabigatran, suppressed evidence that for the drug to be used safely, it probably required the same frequency of blood clot time testing as the older, but cheaper drug. Of course, BI uses the well-worn strawman argument by claiming the “British Medical Journal publishes biased article regarding Pradaxa.” Wow, they must have gotten that line from the antivaccination cult. I’m almost certain that Andy Wakefield said the same thing about the BMJ. BI’s marketing department is laughable at this point. Let’s be clear here. Dabigatran isn’t dangerous, it does what it’s supposed to do, it prevents clots in individuals who have atrial fibrillation. By making a claim, that apparently is untrue, that the drug doesn’t require the testing such as required by the older drug, warfarin, they put patients at risk of bleeding events and serious trouble in the event of traumatic surgery. However, that risk is still outweighed by stroke prevention. Moreover, BI, because it focused on this laboratory testing issue, may have failed to look at other benefits to dabigatran. For example, there is some data, although not convincing yet, that dabigatran may be better at preventing stroke than the older medications, but that might be obscured by the fact that many people are overdosed with dabigatran. However, as the cost of healthcare skyrockets, if there is no difference in stroke prevention or laboratory testing, then the older generic medication, warfarin, simply has a higher benefit to cost ratio than the newer drugs. And as a result of that, all I can conclude from BI’s activities is that they had invested in dabigatran, and they were determined to profit from it. Again, my article shouldn’t be considered a condemnation of Big Pharma or even BI’s researchers. Apparently, some of the researchers knew about these issues, but unethical management put pressure on the results to get what they wanted. Whenever a company engages in this type of unethical behavior, the crackpots will use it as evidence that every single drug is somehow corrupted. BI, you made a mistake. Admit to it, and move on. Nobody likes you for this, and you lied to millions of individuals who use your drug for atrial fibrillation. They’ve got enough to worry about. Cohen D. Dabigatran: how the drug company withheld important analyses. BMJ. 2014 Jul 23;349:g4670. doi: 10.1136/bmj.g4670. PubMed PMID: 25055829. Merli G, Spyropoulos AC, Caprini JA. Use of emerging oral anticoagulants in clinical practice: translating results from clinical trials to orthopedic and general surgical patient populations. Ann Surg. 2009 Aug;250(2):219-28. doi: 10.1097/SLA.0b013e3181ae6dbe. Review. PubMed PMID: 19638915. Reilly PA, Lehr T, Haertter S, Connolly SJ, Yusuf S, Eikelboom JW, Ezekowitz MD, Nehmiz G, Wang S, Wallentin L; RE-LY Investigators. The effect of dabigatran plasma concentrations and patient characteristics on the frequency of ischemic stroke and major bleeding in atrial fibrillation patients: the RE-LY Trial (Randomized Evaluation of Long-Term Anticoagulation Therapy). J Am Coll Cardiol. 2014 Feb 4;63(4):321-8. doi: 10.1016/j.jacc.2013.07.104. Epub 2013 Sep 27. PubMed PMID: 24076487. Next PostNext How can homeopathy help to stop the Ebola outbreak?